The ninth annual New City Arts & The Haven Art Auction live auction will be held at Common House from 6:30-8:30PM and a silent auction will be held at Old Metropolitan Hall from 7:30-10:00PM. For the live auction, check-in will begin at 6:30PM. Bidding during the silent auction will end at 9:30PM. In-person preview of all work at Old Metropolitan Hall from 10AM-6:00PM on Friday, January 18. Opening Reception, Friday, Sept 7th 6:00-8:00 pm. Be the first to see the work at the fundraiser Preview Party before hand from 5:00-6:00pm, purchase tickets from Second Street Gallery. Krista Townsend will show three paintings in this group show at the Second Street Gallery in Charlottesville, VA. Founded in 1973, Second Street Gallery is the oldest nonprofit (501(c)3) contemporary artspace in Central Virginia. Second Street Gallery is committed to offering Charlottesville and the central Virginia region leading-edge new art in perspective and context, and to fostering an active and open appreciation of this art by directly engaging the issues surrounding works by the best contemporary artists in the field. Krista Townsend will have work in this big group show celebrating the dog days of RVA. Krista will be among some of Richmond's favorite folks and and new artists Glavé Kocen is carrying from around the country! Design House is an important outreach and fundraising event for the Shelter for Help in Emergency (SHE). Krista Townsend and 5 other selected artist will display work for sale to benefit SHE. Tickets will be available for purchase online soon and at the door starting May 5. Krista will discuss her show "IMMERSION" at Glavé Kocen on April 14th at 11:30 am in the main gallery. Her talk is entitled, "No Right, No Wrong." She will discuss motivation, meditation, and making mistakes. The 20 page print catalog accompanying the show "IMMERSION" will be delivered from the printer on April 3 and available at the show opening on April 6 from 6pm-8pm. A PDF of the catalog is also available online. The catalog features 25 images from the show and an essay by Sarah Sargent. Krista will participate in SSG's 3rd annual Gallery Rally, an incredible live drawing party and fundraiser event where visitors can watch local artists working side by side. As spectators watch the creative process, sketches become artworks – immediately available for $50 each. Proceeds from the event provide direct support for SSG’s exhibition and outreach programs. Krista moved into a new studio in rural Charlottesville, VA at the end of September, 2017. She has 450 square feet of light filled space. Windows facing north and south overlook rolling fields with the Blue Ridge Mountains peaking between the trees in the distance. "...Nature’s hot-weather celebration is the subject of two exhibitions currently on display at Les Yeux de Monde. “Summer Perspectives” and “More Light” each showcase three artists whose complementary works reveal radiance in the abstract." Krista participated in the annual Girls' Night Out event to benefit The Women's Initiative. The evening featured the Women in Art Auction that was a large part of the fundraising for the local, Charlottesville, non-profit that provides effective counseling services, social support and education to empower women to transform challenging life situations into opportunities for renewed well-being and personal growth. Krista was a fellow at the VCCA in February 2017. She spent over a week painting in a private studio surrounded by many talented artists, musicians, and writers. 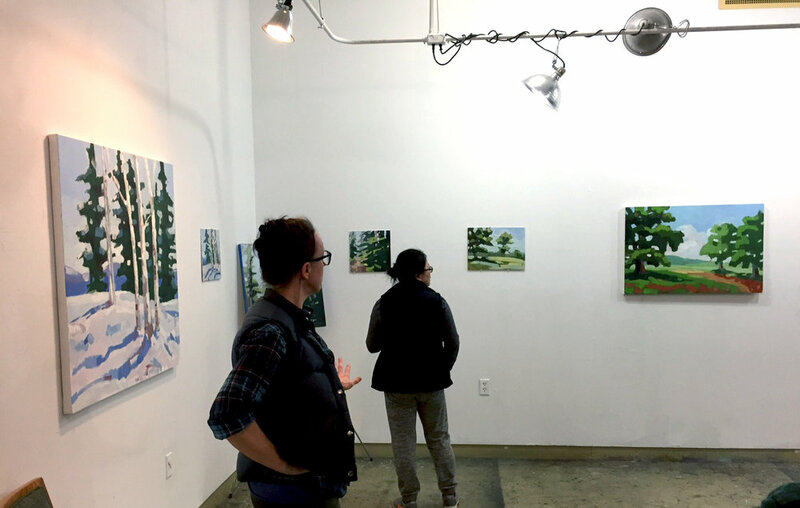 At the end of her residency, she participated in an open studio evening and presented the body of work completed to other fellows and the public. Two Painters Who Are on Fire Close the Year Out at Glavé Kocen! "An intense, almost bluish light floods her work giving it a freshly scrubbed look as if it had just rained. The effect reminded me a bit of the work of Icelandic American painter, Louisa Matthiasdottir. There’s also a hint of Hopper in these empty streets. 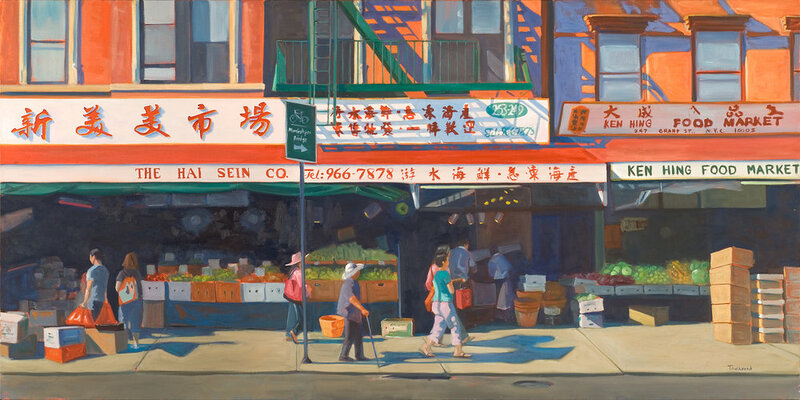 (To me, her “Chinatown” seemed like an animated, updated rift on Hopper’s “Early Sunday Morning.”)"